Most states allow both types of exemptions, some only allow religious exemptions, and one state, Mississippi, allows only medical exemptions. As a progressive, there is little positive I can say about Mississippi, but this is a major positive. So congrats Mississippi for caring about children, at least in this one important way. Some states carefully regulate PBEs through their vaccine exemption laws – while others basically want a signature on a piece of paper. There have been several court cases in New York (here, here and here), for example, that have stated that the state does have the right to regulate religious based PBEs in order to protect the safety of the vast majority of students. New York has show little patience in “fake” religious exemptions based on invented religious beliefs. Good for them. There are various weaknesses in the regulation of religious PBEs and are frequently abused by antivaccination cultists who have no problem with lying on the forms and putting their own and other children at risk of disease. Ironically, hardly any mainstream religion (that is the majority of religions practiced by the US population) is opposed to vaccination. In California, the PBE rate has increased 380% from 0.5% in 1996 to 2.3% in 2010. In response to the increase in rates of personal belief exemptions, in 2012 the California legislature passed Assembly Bill 2109 (AB2109) in September 2012. Previously, California’s law provided for a very simple process that allowed a parent to obtain a PBE by signing an affidavit that stated that any vaccination was contrary to their own personal beliefs. This affidavit was preprinted on the California School Immunization Record, making exemptions relatively easy. In fact, some parents signed it not because they were antivaccination, but sometimes because they just didn’t want to spend the time to dig up the records. Previous research demonstrated an association between easier state exemption procedures and higher exemption rates. In light of that, AB2109 mandates that parents filing an exemption must submit an attestation signed by a licensed health care provider stating that the parents have received information about the risks and responsibilities of refusing immunizations. The governor is well within his rights to direct the Department of Public Health how to implement the law, and it is laudable that he did that in a transparent manner, via the signing statement, rather than behind the scenes. But instructing the Department of Public Health to create a religious exemption from this requirement is neither desirable nor legal. Signing statements are useful and important. They can make transparent the views of the administration on how laws should be interpreted. They can provide courts with guidance on interpreting a statute (though scholars disagree about their role in interpretation), and can help direct public officials how to implement a statute. But a governor can only direct executive officials to act consistent with powers provided in the statute, and may not go beyond it. If the governor goes beyond the statutory mandate, his words in the signing statement do not carry the force of law. A governor is not authorized to add an exemption that is not in the statute without going through the legislative process. It’s possible that Governor Brown’s signing statement may not have much material impact on the law. However, it’s not clear to me how useful this law is going to be over the long run. It’s going to make it an easier choice for some portion of those who have PBE’s to get their children’s vaccinations up-t0-date or to find the immunization record, because they’re already fully vaccinated. This is just a mere accounting change, though it is critical for providing infectious disease specialists accurate data for why a disease spreads through a small community. Of course, those who are vehemently opposed to vaccines, will merely be inconvenienced, but will still go through the trouble of getting the attestation of receiving information about vaccinations. And there’s a middle group, who may be on the fence, who might listen to what is being told to them by the healthcare worker and change their attitude, which would be the best case scenario. 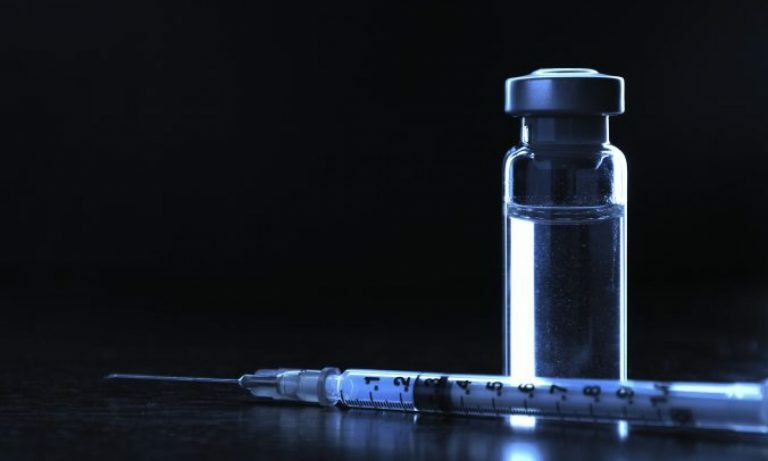 Parental hesitancy regarding vaccines is on the rise. In addition to showing that PBEs in California have continued their upward trajectory, our data reveal strong geographic clustering. This pattern suggests information diffusion or contagion, perhaps within social networks. On the basis of the evidence presented here, we expect that AB2109 may not be sufficient to combat continued increases in exemptions among the children at highest risk for vaccine-preventable childhood disease outbreaks: clustered subgroups of children whose parents have serious concerns about vaccine safety and efficacy. The reason is that these parents are unlikely to be swayed by increasing the opportunity cost of a PBE. 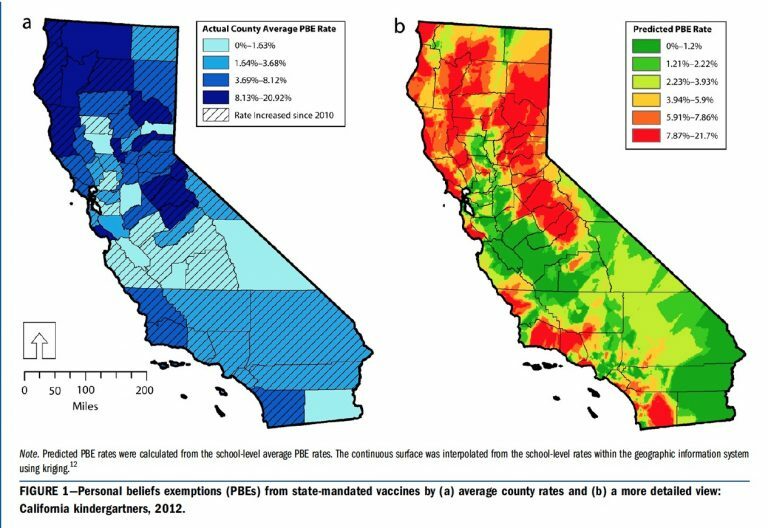 The data show us that some counties in California have up to 20% PBE rates, far above the level necessary to maintain a herd effect, and allowing for clusters of vaccine preventable disease outbreaks, as we’ve seen with whooping cough and measles in California. Once again, with as much feeling as I can muster and as I’ve said numerous times–ban all non-medical exemptions. PERIOD. Religious beliefs that drive antivaccination beliefs, which are mostly inventions unsupported by the actual religious doctrine, put children at harm. I guess that data that shows that children who learn about religion are incapable of distinguishing between fantasy and reality lasts until adulthood. Because vaccines are safe and effective. Vaccines save lives of children and adults. And there are limited reasons to not vaccinate a child. I can’t believe I have to make these arguments in favor of vaccination in a modern world. What is this? The Middle Ages, where most children died before turning 5? Where wizards and dragons were believed to be real things? Where medicine was non-existent? Buttenheim A, Jones M, Baras Y. Exposure of California kindergartners to students with personal belief exemptions from mandated school entry vaccinations. Am J Public Health. 2012 Aug;102(8):e59-67. doi: 10.2105/AJPH.2012.300821. Epub 2012 Jun 14. PubMed PMID: 22698009; PubMed Central PMCID: PMC3464858. Jones M, Buttenheim A. Potential Effects of California’s New Vaccine Exemption Law on the Prevalence and Clustering of Exemptions. Am J Public Health. 2014 Jul 17:e1-e4. [Epub ahead of print] PubMed PMID: 25033149. Omer SB, Pan WK, Halsey NA, Stokley S, Moulton LH, Navar AM, Pierce M, Salmon DA. Nonmedical exemptions to school immunization requirements: secular trends and association of state policies with pertussis incidence. JAMA. 2006 Oct 11;296(14):1757-63. PubMed PMID: 17032989.